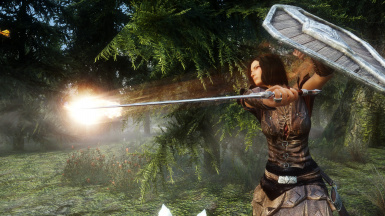 Adds spell casting functionality to weapons and shields in the form of enchantments. 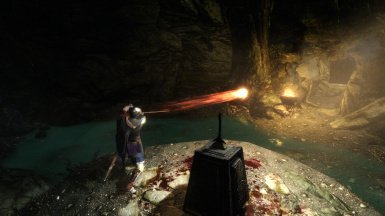 Spell-enchantments can can contain any spells, including spells from mods, and can be cast by pressing a configurable casting button and either attacking or blocking. 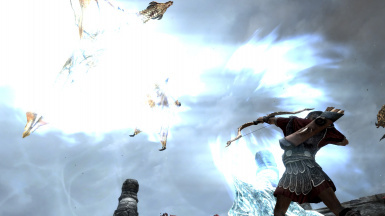 Fixed an issue where DLC spells in non-requiem versions of the mod weren't working. 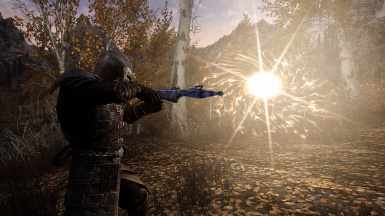 Requiem support adds over 40 new spells to weapons in addition to gameplay changes. 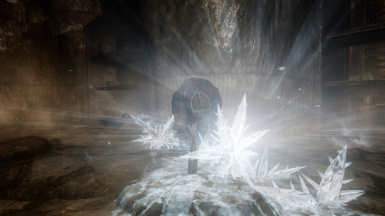 The biggest change is that spellweapons are only unique treasures... unless you make one yourself, which requires knowing the underlying spell. User's can now choose "No DLC" when installing the mod (originally forgot to provide that option... users could still manually turn it off if needed). 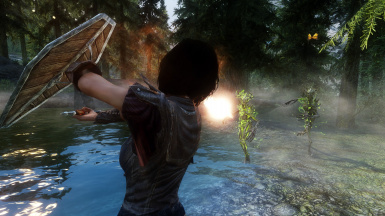 Fixed a bug where the player stopped being able to cast with their weapon. To update, just install and load your save like normal. 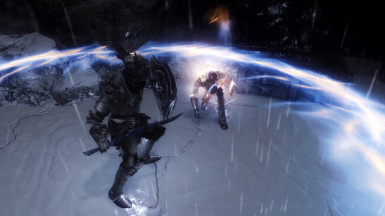 DLC spells now supported! 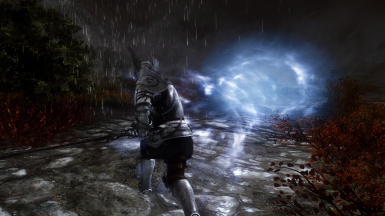 There are 4 new spell-enchantments per DLC. Added controller support. To use, you'll need to activate the option in the MCM. 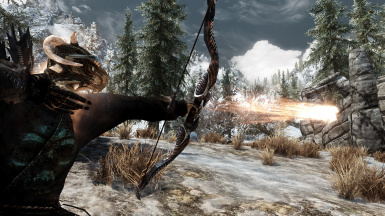 Added bow/crossbow functionality. 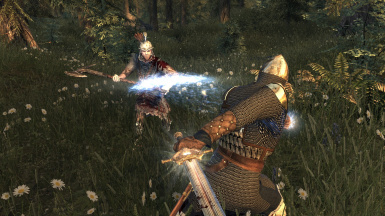 Offensive spells are cast when an arrow is released, defense spells are cast when the bow string is fully drawn. Added an MCM option for toggling the casting button. 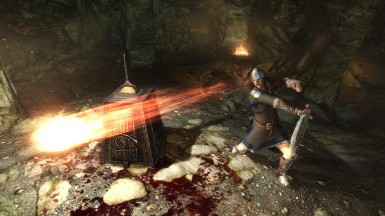 Auto casting (casting no longer requires re-pressing the button to cast additional spells). Autocasting charges the spell cost at animation rather than on key press, so just keep that in mind. Spell-enchantment inventory system based on Chesko's Weapon Scroll Wheel mod. 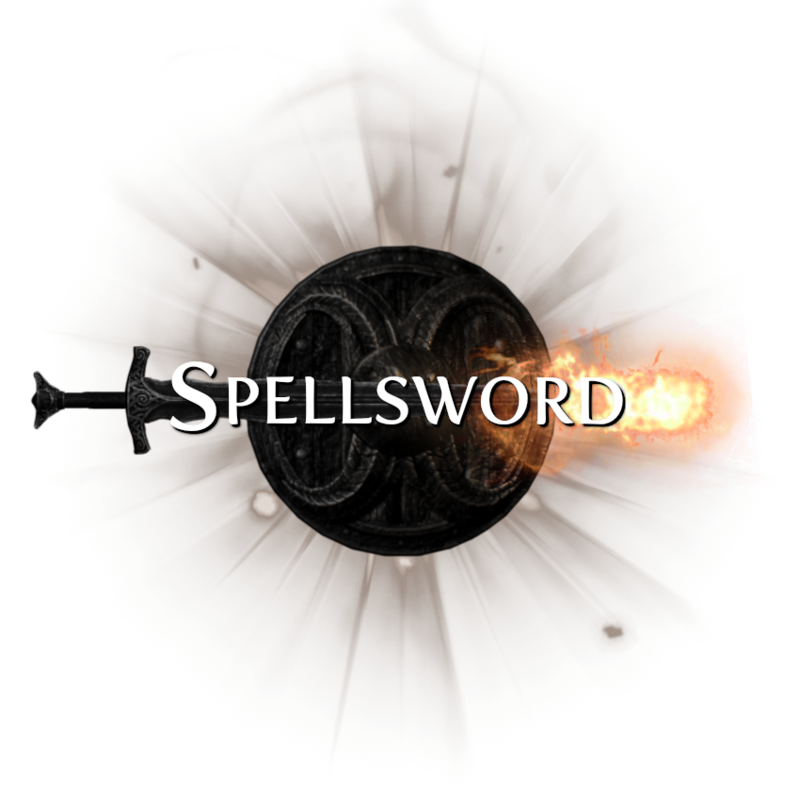 Spells from spellweapons are now "equipped" and the changing which spell able to be cast is done by either pressing a toggle-next button or pressing that button in conjunction with the scroll wheel (configurable in MCM). Changing MCM settings no longer unequips weapons. Overall scripting overhaul. Scripts are slightly faster in addition to being much more versatile (this is what took so long; some features above, like controller support, required bigger changes). Versioning. While this version doesn't work with my previous version, all future versions should now work together (unless I do something drastic). 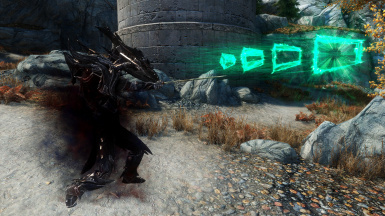 Fixed a glitch where sometimes spells couldn't be cast from the right hand. 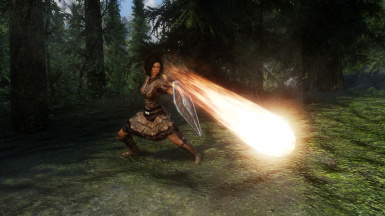 Fixed the Firebolt spell from having a 0 second charge time back to a 0.5 second charge time. 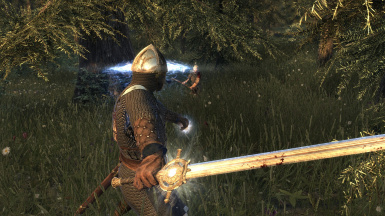 Spellsword enables the casting of spells via weapons and shields. 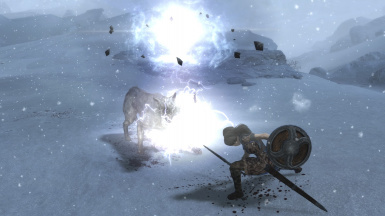 The basic premise is as follows: weapons, shields, and jewelry can now be "spell-enchanted," enabling the player to cast a spell with their weapon or shield. To do so, press the MCM configurable casting button and then either attack or block. The same as many other mods; if you are doing a manual install, just unpack the folder and add the files to your data directory. However, I suggest using a mod manager such as Vortex or Mod Organizer 2. For Mod Organizer 2, click the top icon, second from the left, which reads "Install a new mod from an archive." You'll be prompted by an installer which lets you install the base Spellsword .esp and a few optional add-ons. After installation, just click the checkbox in the left mod window to turn it on! It shouldn't matter too heavily where it sits in the install order (left pane). Keep in mind that some of the add-on .esp files require masters (e.g. Spellsword Apocalypse requires the mod Apocalypse), so the load order (right pane) should only matter if you have one of those installed; in those cases, place the add-on .esp files visually lower (i.e. higher priority number). 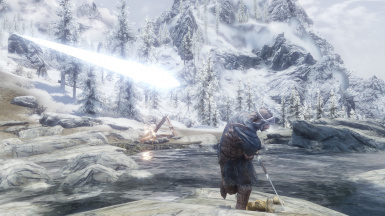 Requiem users: This version of the mod DOES work with Requiem (and any other spell mod for that matter), though not perfectly. I'll be making a special patch for Requiem later which makes it work better. SKSE SE, SkyUI 5.1, and Jaxonz Renamer (or Jaxonz Utilities if you prefer). 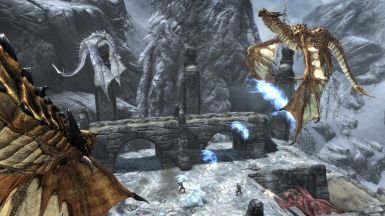 A few notes: Spellsword does not depend on SKSE version, so Skyrim updating each month will not break it. Jaxonz Renamer/Utilities must be installed but the .esp does not need to be activated if you do not want to use the mod. When you first load the mod, you should get a quest to obtain a book from the MCM. 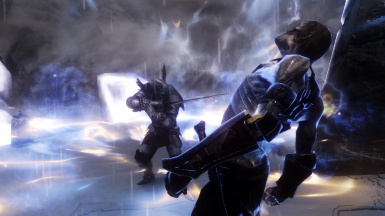 Open the MCM, familiarize yourself, assign your casting button and your spell inventory button, and then choose the option to send yourself the manual "Combat Casting." 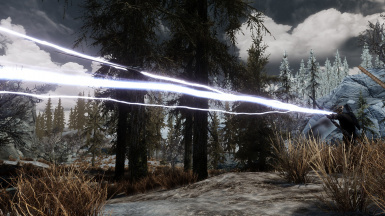 Once you've read it (it details how to use the mod in-game), you'll be given an opportunity to start with a basic spell-enchanted item. This will conclude the quest. New spell-enchantments will not contain any spells. To fill the spell-enchantment with a spell of your choosing, equip the spell in your right hand. Then navigate to your inventory and press either the casting key or the spell-inventory key on the spell-enchanted item you wish to add the spell to. This will prompt you for which spellslot you want to fill (most items, especially at the start of the game, will only have one). 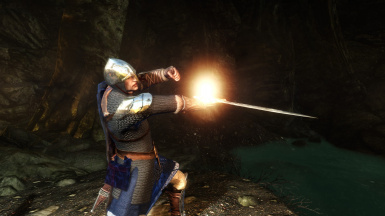 To cast a spell from your new weapon/shield, simply press and hold down the casting button and attack or block (depending on the spell). 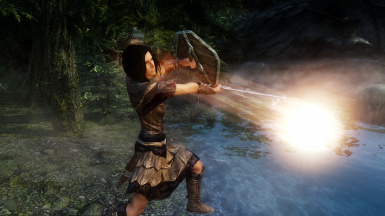 While concentration spells must be cast on block, all other spells can be configured to be cast on attack or block in the MCM (make sure the spell-enchantment you want to configure is equipped). 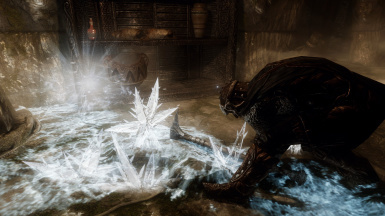 Note that jewelry cannot cast spells and can only hold spells; to cast these and other spells, one must use any enchanted weapon/shield (including weapons/shields with unique enchantments or enchantments from other mods). 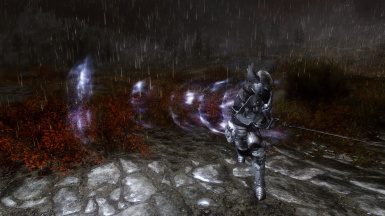 If you have multiple spells from spell-enchantments equipped (either through dual wielding or multiple enchantments), only one may be active and ready to cast at any time. To change your active spell, cycle through your spells using the spell selection key. 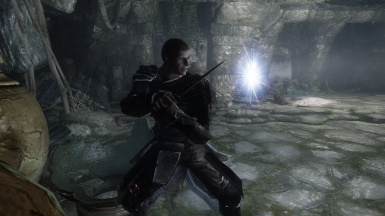 If you decide to dual wield spell weapons, you will lose your ability to cast any spells that are set to cast on block, though the use other other mods which allow blocking when dual wielding will fix this. 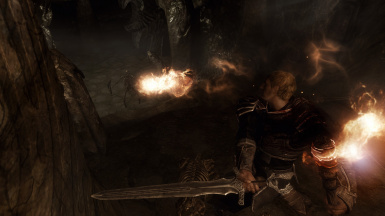 Note that you can channel the charge of one weapon in one hand to cast the spell in the other. 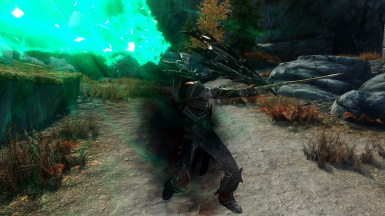 So if your current spell-enchantment is for the right weapon, and you charge the spell and swing with the left weapon, you can use the left's charge to cast the spell on the right weapon. 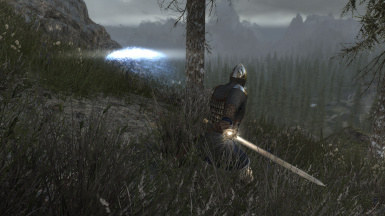 tl;dr: install the mod, get a spell-enchanted weapon, hold the casting button and then attack or block. As you may have seen in the MCM, you have the option to assign fractional spell costs to your magicka, stamina, and/or the enchantment charge reserves. So, if a spell normally costs 100 magicka, and your MCM settings are 0.8 for magicka, 0.2 for stamina, and 0.25 for enchantment charge, the spell will cost 80 magicka, 20 stamina, and 25 enchantment charge units. Or 0,0,0, if you wanted. The goal here is to empower role-playing and let the player decide their gameplay balance based off their personal preferences. 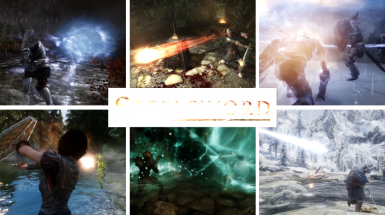 With Version 2.0.0 comes compatibility with all spell types, all spell mods, and all shouts. 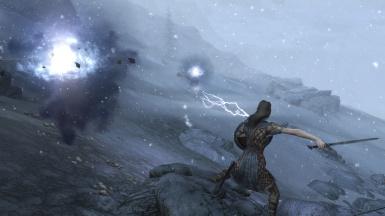 However, because I no longer curate a list of spells/shouts (since doing so for all mods is virtually impossible), some spells/shouts may not function perfectly or even at all. In my testing this was rare but it did happen (e.g. Whirlwind Sprint). 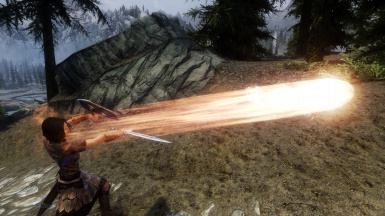 But you should know that, because of the new scope of this mod, I will not necessarily consider certain spells/shouts not working well with this mod to be a bug. 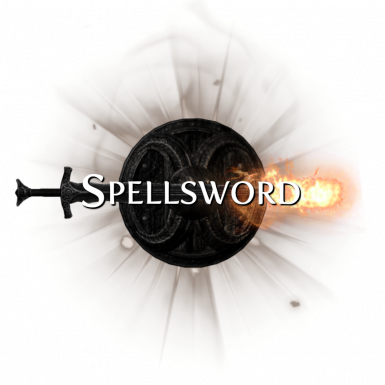 While Spellsword Version 2 allows all spell mods and spell types to be used without the need of patches, creating patches can do three things: Distribute spells on spell-enchanted loot, add custom sounds to the spell casting, and auto-assign sounds to the spells that are spell-enchanted. 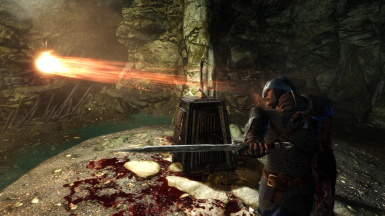 Shouts can be cast with weapons and shields too, though this requies a special shout-enchantment. Spell-enchantments can contain no more than 5 spellslots. This shouldn't be possible anyway unless you use additional mods which allow you to do three or more enchantments per item. Honestly, this mod should be compatible with nearly everything. Again, though, this does not mean that every spell or shout will necessarily work with it. The click-to-spell-enchant feature will sometimes chose the wrong item in your inventory if you have several of the same/very similar items in your inventory. To fix: just remove the similar ones, spell-enchant, and then add them back. 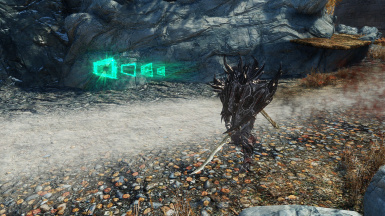 Anything that auto-equips/auto-unequips spell-enchanted items from your inventory (e.g. 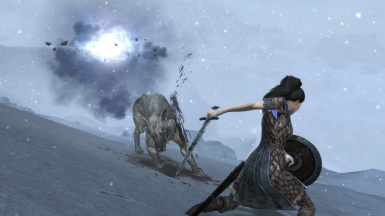 unequipping a two handed weapon which then auto-equips a spell-enchanted item into your left hand, or turning into werewolf, or cursed items) will not modify your spell-inventory accordingly. So, if you get certain spells "stuck" in your inventory, this is probably why. To fix: go to the MCM and click "Reset Scripts," then re-equip your items. Very very very rarely the player stops being able to cast spells. Like, in 40+ levels this happened once. To fix: Just load into a new area (go through a door), quit and restart the game, or use another weapon. Also try the new MCM button for resetting the scripts. Done First and foremost, I plan on making a DLC patch ASAP. 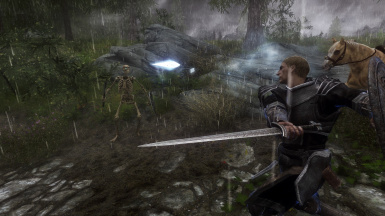 In specific, I really want Dawnguard anti-undead spells for Paladin builds. Done Next, I plan on making a Requiem patch. I love Requiem. I've already investigated and think this should be pretty simple to do (with mass effect and all). Done Eventually, I might make all spells (besides concentration) available as enchantments. It just takes a bit of monotonous work. Done As it turns out, there might be a way to even allow concentration spells on weapons, but I'll have to do more research on that. Don't expect that too soon. Will Not Attempt I'd like to do animations for some spells, especially the defensive spells. It would be nice to do the staff gesture for things like candlelight rather than use the block animation. 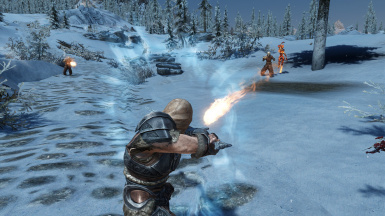 Done Wouldn't it be cool if weapons could have multiple spells? 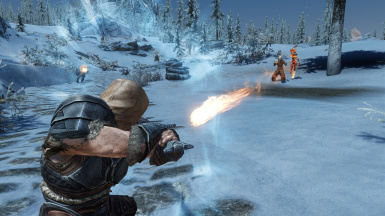 And then you could choose which spell to use via the scroll wheel, like Chesko demonstrated for weapons. I might try doing that eventually. Done Once SKSE64 is out, I'll port this over to Skyrim Special Edition (SSE). Done Future versions of this mod will likely be incompatible with the current version as I didn't lay the proper groundwork for version transitioning. I hope to fix this soon. I'd like to get this working with VR (it currently does not work). I'd like to manually curate a Requiem patch. 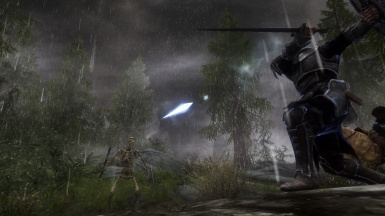 Q: Will this be released for SSE? A: Unfortunately, no. This is due to technical limitations of the systems. A: Yup! And they should be safe!! I've followed every scripting best-practices I've seen so that this does not brick your game or lead to save bloat. There are bound to be bugs, of course, but none should be game breaking. 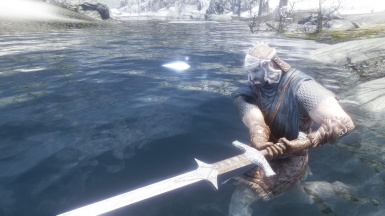 I've tested this on 40 levels of a character using plenty of other mods alongside it and had no problems. If you experience any, please let me know ASAP! My number one goal is to provide stable mods that are fun. Emphasis on stable. 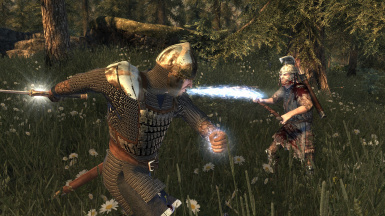 Q: Do the spells cast with weapons still give experience? And is it done correctly (e.g. firebolts hitting trees don't give experience, hitting bandits do)? 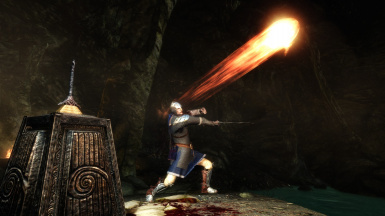 Q: Do the spells cast with weapons still utilize spell cost reduction equipment/magic effects correctly? 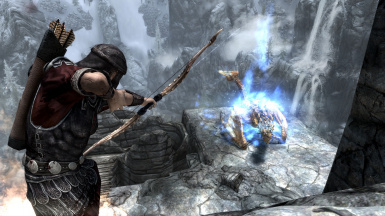 Q: How do multiple spell weapon enchantments work together? 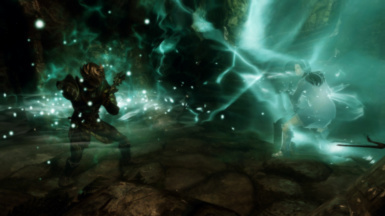 A: Spells from enchantments are put into a spell inventory which the player can toggle through. Q: Is there any feedback when casting a spell? 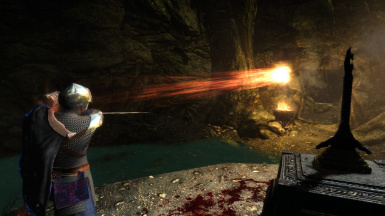 A: Yes, there is an optional graphical effect and a sound for casting. There is also feedback for failing a spell and for changing spells. 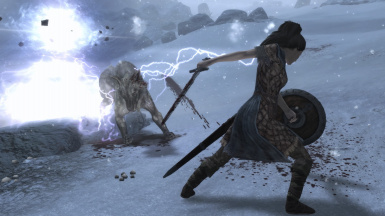 Q: How does the mod treat shields? A: Shields are now able to cast spells too! Provided they are enchanted. 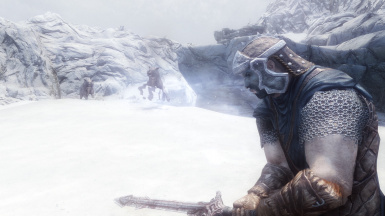 Q: Does this mod work in first person? 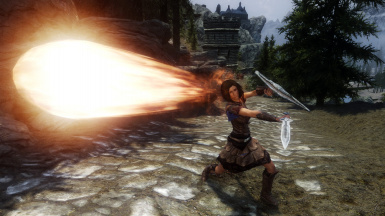 Q: Can you cast spells from other mods with weapons? 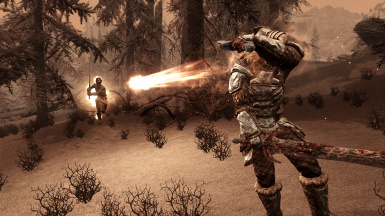 Q: Does this mod work with perks from Ordinator? 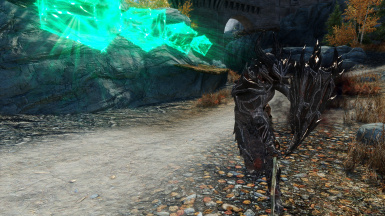 A: I'll let raziell74 answer: "I also use Ordinator and I'm happy to report that yes the perks do apply to the spells used with this mod. 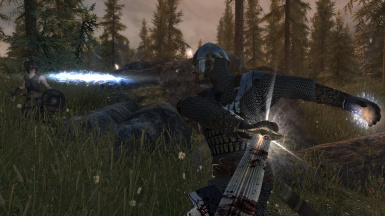 It's really satisfying seeing Cataclysm proc when you fire off incinerate at point blank with a sword." I've been advantaged by all the hard work previous modders have done and documented. In this regard, groups like Bethesda, the Nexus admins/programmers, the SKSE team, the SkyUI team, and Jaxonz are all very appreciated. I'd also like to thank Chesko for adding some cool tools and tutorials. I've used the tutorial for the Weapon Scroll Wheel mod for use in my spell inventory script and have integrated Lilac into the development (right now it is used more as a curiosity but it will become more prevalent later). Thank you to Nexus user Avastgard for fruitful conversations we've had in the forums and for what eventually became Spellsword Emergence. 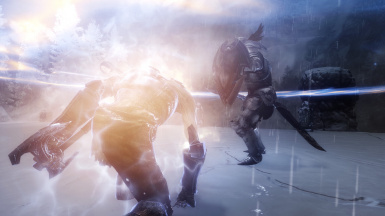 ENB: Vividian in some, SnowFall Weathers in others, NLVA in others. 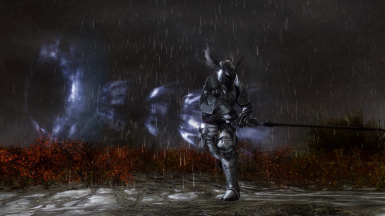 Armonizer for the Azura Paladin armor. Thanks MxR Mods! Spellsword starts at 2m30s. V1.0.0. Thank you Sinitar Gaming! 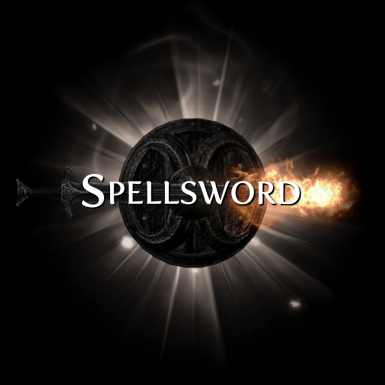 Spellsword starts at 12m07s. V1.2.2. Thanks VatiWah! 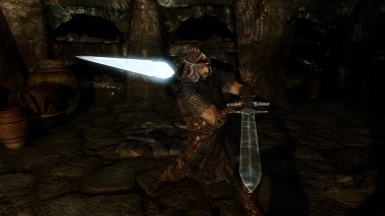 Spellsword starts at 40s. V1.0.0.